The Loft Trailer And Poster - Are You Screening? 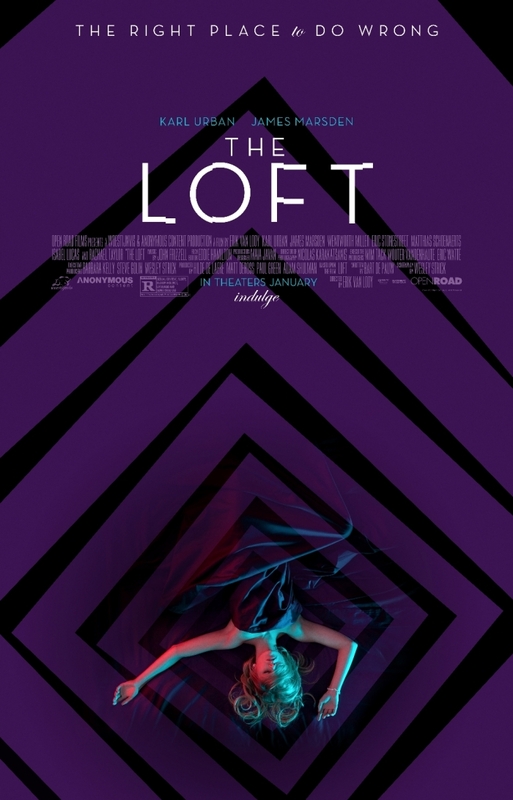 The Loft is hitting theaters January 23rd, and this might be the “flying under the radar” gem you don’t want to miss. Like most years, the buzz and attention of award season means that there is little room to focus on things that are coming your way in January. This one, based on the 2008 Belgian film, and starring Karl Urban and James Marsden, looks to be a solid offering for those looking for a bit of tension. Five married men rent a loft to be their secret spot for… whatever they might need a secret spot for, and oddly enough, things go wrong. It seemed like such a foolproof plan. Karl Urban (Star Trek Into Darkness) and James Marsden (2 Guns) star in the tense psychological thriller THE LOFT, the story of five married guys who conspire to secretly share a penthouse loft in the city–a place where they can carry out hidden affairs and indulge in their deepest fantasies. But the fantasy becomes a nightmare when they discover the dead body of an unknown woman in the loft, and they realize one of the group must be involved. Paranoia seizes them as everyone begins to suspect one another. Friendships are tested, loyalties are questioned and marriages crumble as the group is consumed by fear, suspicion and murder in this relentless thriller.